Understanding Meat Labels: Grass-fed, Pastured, Organic and Natural | Our Farm by Earth Flora Inc. Confused about all the novel terms for meat? There’s “organic” and “grass-fed,” or “pasture raised.” What does it all mean? This really means your cow are raised on pasture and fed grass. The cattle’s diet consists of grass, the natural diet of cows. You are what you eat. Cattle that spend their lives grazing on pasture, compared to those that are fed grain (which is really NOT their natural diet), are always healthier. The meat is richer in Omega 3 (because Omega 3 lives in the green leaves). Meat is rich in Vitamin E and beta carotene, and is a good source of conjugated linoleic acid, or CLA, a powerful cancer fighter. Usually, farmers who raise their cows on pasture strive to keep it organic or follow sustainable farming practices. This means no chemical fertilizers, pesticides or antibiotics. This is also because cows are typically healthier and thus do not need hormones or antibiotics. However, there is (yet) NO standard for Grass-fed. The only requirement is access to grass during its life. There is also no restriction on the use of antibiotics or hormones. In fact, cattle could be kept in feedlots and fed grass, and the beef they produced could still be sold as grass-fed. The cattle can also be raised for part of their lives on grass (pasture) before they are sent to feedlots and can still be described as “grass-fed”. This is sad because the healthy qualities of grass-fed beef come from the constant movement of the animals in the pasture as they graze, not just on their grass-based diet. Another issue to watch out for is grass fed dairy cows. According to Sally Fallon, Nourishing Traditions, “modern day cows are a freak of nature. Holstein cows [cow breeds you usually find in the supermarket, including those from Australia and New Zealand] have been produced by selective breeding to produce cows with abnormally active pituitary glands and by high-protein feeding. The pituitary gland not only produces hormones that stimulate milk production, it also produces growth hormones. A superfluous amount of growth hormones can result in grown abnormalities. Excessive pituitary hormones are also associated with tumor formation and some studies link milk with cancer. The freak-pituitary cow is prone to many disease and almost always secretes pus in her milk and thus needs frequent doses of antibiotics.” Note that about twenty (20%) percent of the beef in Australia comes from dairy cows and about 40%, in New Zealand. “Cattle are healthiest when they are eating the food they evolved to eat (grass) under the conditions they evolved to eat it (grazing).” True grass-fed, even pastured, should be fed grass from start to finish, and without antibiotics or hormones. When looking for healthy, quality beef, look for beef that is 100% grass fed and raised only on pasture. These animals are not given any animal bi-products, antibiotics or hormones. This only means that the animals were raised outdoors on the pasture. Again, the term is not regulated. As of now, there is no requirement on how much percentage of pasture is needed to properly label a product pasture-raised. According to Dr. Aaron Grass of Farm Forward, “All cattle are ‘pasture-raised’ for the first few months of their lives before they are sent to feedlots, so even the most confined beef can be described as ‘pasture-raised.’” Thus, most animals will be raised with some pasture but may still be with a lot of access to grain. They can also be raised on pasture but finished on grain. The animals can also be fed antibiotics or injected growth hormones. True pasture-raised should be cows on pasture from birth throughout their entire lives, with no feedlots. 100% Pasture-Raised” (like 100% grass-fed) indicates that the animals were never confined in feedlots, spent their whole lives outside on pasture living cow lives. Organic has actually very little to do with the animal’s quality of life and is mostly just about their feed. USDA Organic meat is derived from animals that are fed organic vegetarian feed (no animal by-products) and had “access” to pasture or the outdoors. No hormones, antibiotics or cloned animals can be used. However, USDA Organic animals, for the most part, DO NOT require a grass-only diet. The animal can still be fed an unnatural and unhealthy grain (even GMO corn and soy) and raised in feedlots. So, unless it is labeled grass-fed, organic cattle is fed organic grains. This is again the problem. Cattle raised on grain, even if it is organic, is not as healthy as cattle raised on grass. Therefore, it produces meat that is lower in omega 3s, vitamin E, and CLA than its grass-fed counterpart does. Without Antibiotics & No Antibiotics Added Only means that the animals were raised without any antibiotics or hormones (for growth.) Again, this has little to do with the animals’ living conditions or their diet. According to the USDA, a product containing no preservatives, artificial ingredients, colors, and minimal processing can be labeled “natural.” Natural doesn’t tell the consumer anything about an animal’s living conditions, whether antibiotics or hormones were used, or what it ate. The animal can still be fed an unnatural diet of grain. 100% Grass Fed. 100% Pasture-raised. 100% Native breeds. DowntoEarth cattle are raised the traditional way: grass and grazing. They are raised by small family farms with one or two cows. The cattle have never been on a feedlot nor are they fed antibiotics, grain (GMO corn or soy,) or hormones. 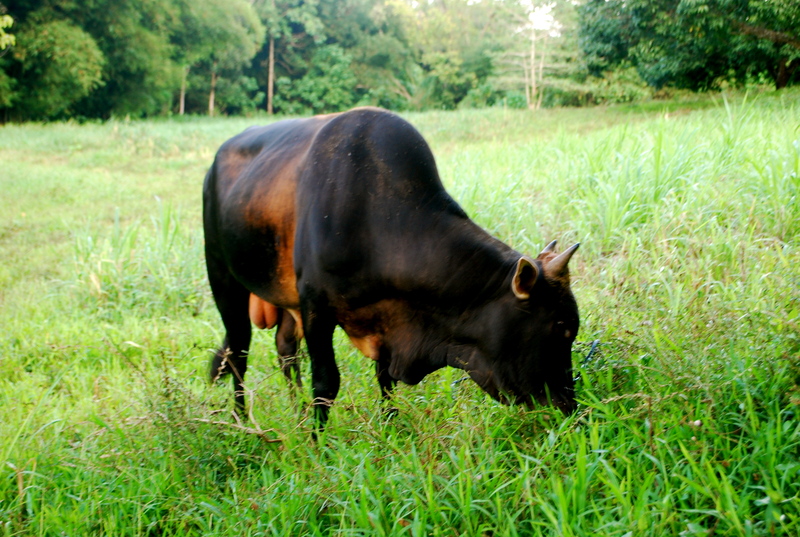 They always eat grass and graze all-year round in the green, abundant pastures of Mindanao. More importantly, they are treated humanely and are not castrated or dehorned. DowntoEarth Grass-Fed Beef comes from the the native Bali or Banteng and Chinese Yellow Cattle cross-bred with Nellore or Ongole and American Brahman cattle. The cattle is native, hardy and have been bred and raised for use as draft animals in small farms. Because of this, they are entirely raised on pasture, fed grass and without the use of any antibiotics or growth hormones. DowntoEarth desires to promote local, native and indigenous cattle breeds. By doing so, we are able to ensure not only optimum health benefits in the food we eat. This should be standardized so that the consumer is not deceived or confused. Grass fed and pasture raised cattle should mean just that. It should be illegal to label it that way if it is not 100 per cent….Like so much of our food information, this is just allowing the food producers to deceive the consumer with tactics designed to mislead them.